Eleanor Pearl stood at the window and watched the sky grow dark. Her guests had gone and the house stood empty. Tonight was a jumping night. The evergreens shook their boughs and seemed to twist to face the mountain, where their brethren thinned and made room for the flat-smooth rock that rose there. Eleanor Pearl could see the climbers, first as subtle specks against the leaden stone, then stark and small against the snowy peak. And just beside it, the moon climbed fat and full into a field of winking stars. Eleanor Pearl had kept the house at the mountain for time out of memory and, for just as long, the jumpers had come from far across the valley to climb. They would stay at the house, waiting for the moon to make its closest pass, and then set off through the trees, all manner of packs and satchels in tow. She could see them leaping now, from the gleaming snowcapped peak onto the pendant moon, and soon they would be carried up and away and into the sky, never to return again. Once, some years past, a peculiar man had come up from the valley. He was peculiar in that he was very quiet, and looked long and hard at Eleanor Pearl whenever he had the chance, and would smile and do small favors without her asking. But most peculiar of all was this: He stayed. Others came and went on their way up the mountain, never passing more than a day or two at the house, but the peculiar man stayed and kept Eleanor Pearl company—standing with her at the window, watching the shapes on the mountain, watching them leap onto the moon and sail away into the sky. For weeks he stayed, and he and Eleanor Pearl walked in the valley and swam in the river and watched the moon go up and down. Until one evening, when the sun had set and the jumpers were massing for their walk, when at last he said: “Follow me.” And he led her through the quaking trees and up the mountain, onto the flat-smooth rock, over the gleaming snow, and up to the very top. He looked at her then, this peculiar man, and turned just as the moon was rising. It was bigger up close—enormous and silvery and pocked with dents—and its dusty skin seemed it would be softer even than the fresh, drifting snow. And all at once he leapt, arms flung wide, into the emptiness of the cold mountain air. And just when it seemed he would surely plummet to the piney flats below, the moon took hold of him and pulled him close, and he landed with a barely discernable thud. And he looked down at Eleanor Pearl and beamed, and stretched out his hands to her—an invitation—but Eleanor Pearl stood at the mountaintop, straining forward. She could not find the courage to jump. Others went past, off the mountain and into the sky, as she watched in trembling fear, and before long the moon shrank and sailed away, and the peculiar man’s smile faded and faded. Since that night, more moons had passed from horizon to horizon than anyone could count. Eleanor Pearl had met more climbers, more comers and goers, than any person alive, and had heard more tales than could fit in every book in every language ever written. But though she secretly hoped the peculiar man would someday return and tell her of his journey through the starlit sky—suspected, even, that he had returned already, perhaps many times, wearing different faces and using different voices—she could not be sure he ever had … or ever would. And though sometimes she hoped she would have another chance to follow him and leap to the waiting moon, more often than not she feared the only chance she would ever have had long since passed her by. It was the only thing she regretted. So, if you should ever find yourself at the house by the mountain, and should chance to meet the woman called Eleanor Pearl, please: Ask her to wait just a while more. The path through the stars is somewhat longer than one would suppose—and so incredibly hard to travel alone. 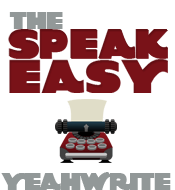 This story is for the Speakeasy at Yeah Write, which gave us this sentence for a prompt this week: “It was the only thing she regretted.” This one bumps right up against the Speakeasy word limit, at a whopping 750 words total. Click the badge above to read other stories for this week’s prompt, and (of course) give me some commentary love below if the mood takes you. For more of my Speakeasy stories (and to generally watch me toot my own horn) click over here! Awesome! The tone of the narrator sounds like it is telling one of La Fontaines’s Fables. This leads me to think that this is a metaphor, or carries a “morale” of some kind, a lesson to be learned. Is it a representation of Love (a daring leapt that may send you on a trip through the stars? ), is it Life? I have no Idea. Whatever the case, it’s intriguing. I assume that is what you were going for, if anything. Congrats! I guess so… Man, I didn’t know blogging meant I had to behave like a writer. Starting tomorrow, I will wear nice clothing on every occasion, eat at fancy cafes, wonder around with an obscure yet impressive book under my arm, and watch indie cinema. Until then, I’ll enjoy the game with my chips n’ soda. 😉 Ahem, I mean, yes, truly, this is a very (dammit what’s that word again?) creative way to…..
Yep! Time to break out the tweed jacket with patches elbows! It has been a while since I have stumbled across your path and I’m glad I did. I always find your writing to be fresh, evocative, and engaging. I’ll have to stop by more regularly! I too have stepped out of the blogging arena. Maybe it is time to stick a toe back in. Oh, this is lovely. The imagery is fabulous–the moon climbing into a field of winking stars…just beautiful! I love the imagery and how your story drew me in. Her fear is poignant, still she has regrets and wishes for another chance to make a different choice. This is a spectacular story and the art work reminds me of Hokusai. Thanks for this! Thanks! The artwork is actually by an artist named Hiroshige. I’ve just added a link to the piece on Wikipedia but it’s also. I thought it captured the spirit of the story pretty well, so I went with it. I think you knocked this one out of the park. It has all of the best elements of a fairy tale told lovingly and with just enough magic. Loved every single word. I loved this, very beautiful story! You’re right, we went along quite similar paths! That last sentence is beautiful by the way, and it gives the story a bit of a fable feeling. By the way, Eleanor Pearl is a great name. Well done all around! I found myself deliberately slowing down as I read this – always a good sign, since it means that I want to savour the phrasing, e.g. “Since that night, more moons had passed from horizon to horizon” – such an elegant way to say that time passed, while giving a sense of distance, too. Well, (in the slightly dubious spirit of a mutual appreciation society 🙂 ) I voted for Eleanor Pearl. Glad it won – I think it’s a perfect piece. What a wonderful picture you paint with your words. It’s s tough title to bestow, but I think this is my favourite piece of yours ever, Brian. The language is both beautiful and epic, which is especially impressive given the actual length of the story; the characters are strong even though you don’t weigh it down by describing them, and the story itself is unusual – tough thing in this world of a billion tales – timeless, and powerful. The metaphor resonates, but also the story itself. I love the way you reveal the POV at the end and make it much more personal in doing so. Freaking fantastic writing, Brian! You managed to match the tone of the song impeccably. I reread it at least 8 times and then read it out loud to the room. Bravo! Wow, thanks! I feel like that’s one of the biggest compliments anyone can pay me – that they felt like rereading something I’d written. I’m really glad you liked it! I finally had a moment to sit down and read this (after days of having it open on my computer). Am I ever glad I did; it took my breath away. It was so good, I almost thought I should give up writing. If I was to quote back to you my favourite line or two, I don’t even know where I would begin. I think this may be my favourite short story ever.